I made a trip down to our Rulo Bluffs Preserve last week. I wanted to get down and see the results of the prescribed fire we conducted earlier this spring. We’re in a restoration mode at the site, trying to re-open the woodland and increase the amount of light hitting the ground. The day we burned the site this spring, the relative humidity was very low, so the fire was a little hotter and burned a higher percentage of the unit than we’d seen in previous burns. Killing small trees and brush with a nice hot fire was good for our objective. On the other hand, I worried a little that we might have cooked some of the bigger trees we wanted to keep. A panorama (four photos merged together) along the edge of the burn unit. The area burned this spring is to the left and the unburned is to the right. Overall, I was very pleased with what I saw last week. The fire, combined with some recent “hack-and-squirt” herbicide treatments on smaller trees has done a great job of increasing the amount of light hitting the ground. At the same time, the majority of larger trees were still alive and leafing out, maintaining a fairly complete canopy – but one that allows for mottled light to hit the ground throughout the day. We hope to continue annual, or at least very frequent, fires for the next several years to set the woodland back on the trajectory we want. Then we may back off on the fire frequency a little. Eventual success will be measured by whether we see an increased abundance of wildflowers, sedges, and grasses on the woodland floor, and – more importantly – regeneration of oak trees, which is crucial for the survival of the woodland itself. Here are some photos of this year’s spring fire, as well as what I found during my walk through the site last week. 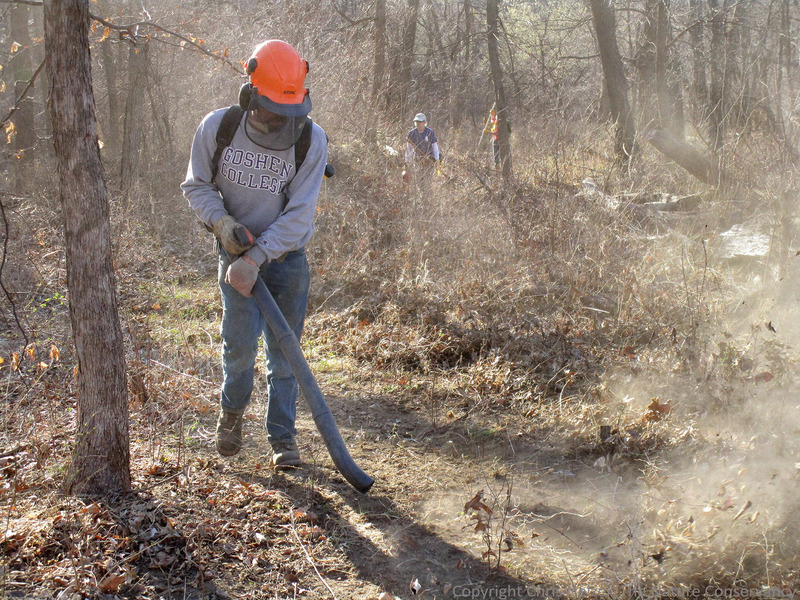 Firebreaks for the fire were mostly created by using a power leaf blower to clear out a narrow trail. Nelson Winkel is shown here making a final pass around the breaks of the 100 acre burn unit. Other members of the crew followed behind, raking out any other debris that needed to be cleared from the breaks. Anne Stine lights down a slope during the fire. 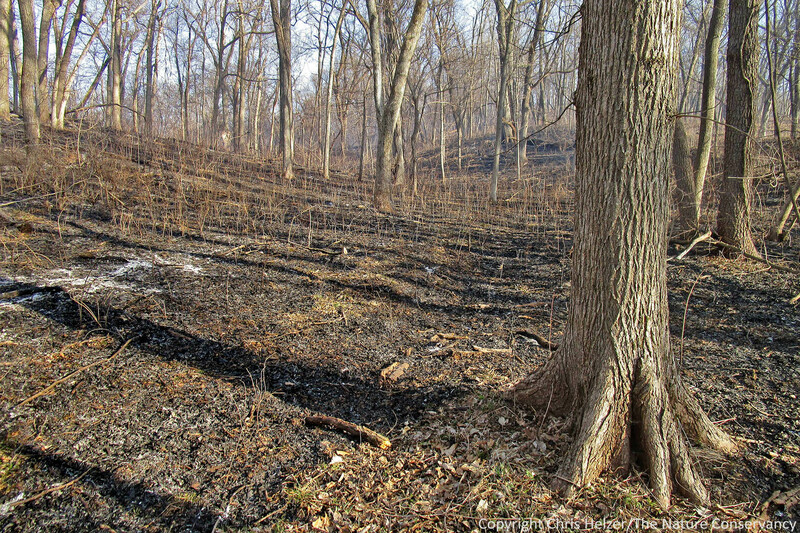 The fire burned a little more intensively than most woodland burns we’ve done at the site, but nothing like a prairie fire – though it got pretty hot as it went up some of the steeper draws where leaf litter had accumulated and slopes helped drive the fire. Crew members patrolled the narrow breaks constantly during the burn, checking the fire, raking leaves and sticks in, and looking for dead trees burning along the edge of the unit that might need to be taken down. 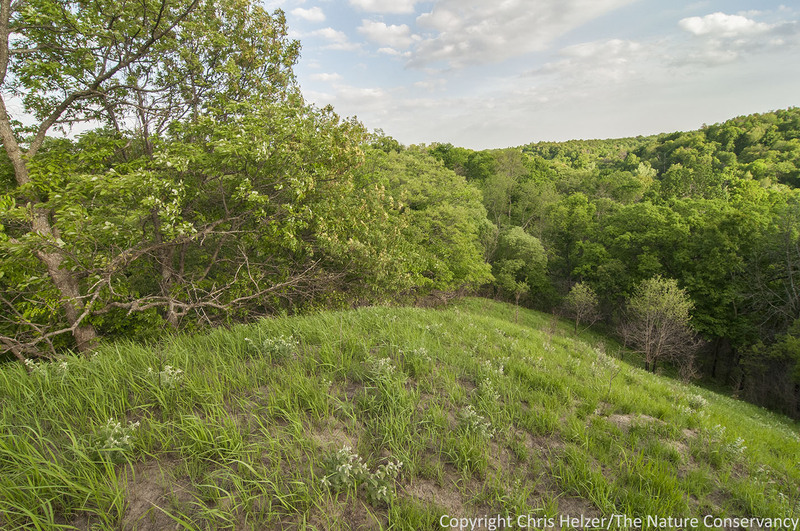 This stitched multi-photo panorama shows the largest of the prairies at Rulo Bluffs, along with some of the woodland. The photo(s) were taken from our neighbor’s pasture during the fire. This area burned fairly completely but there were still small unburned patches here and there. 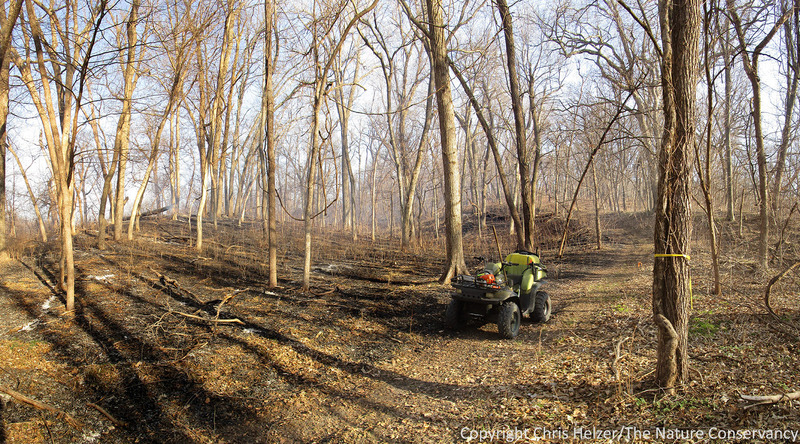 We were able to use ATVs to access some portions of the firebreaks, but others were too steep and/or narrow, and were accessible only on foot. This panorama shows approximately the same area as Anne was lighting in the earlier photo. The right half of this image was burned, the left was not. Note how much more open the burned area is. Burned on the left, unburned on the right. Wood nettles seem to be having a banner year in both burned and unburned areas. I’m not sure why that is. More wood nettles (and other plants) – this time on a southeast-facing slope that burned pretty hot. Note the dead (or at least top-killed) small diameter trees. Wood nettles were most abundant on lower slopes. 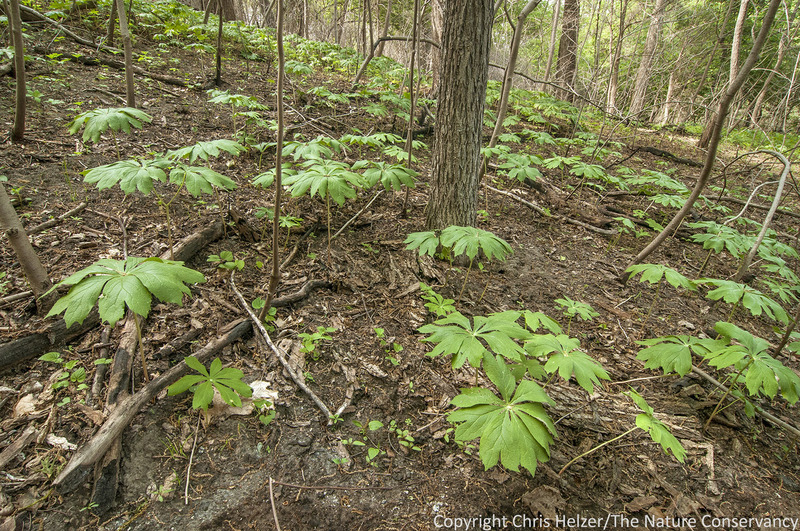 Higher up, mayapples, sanicle, and other plants were more common. Here, mayapples grow with little company. That will change as the plant community adjusts to an environment with more light availability. The fire wiped out this year’s crop of garlic mustard. Hopefully, maintaining a high fire frequency in coming years will help suppress that invader. 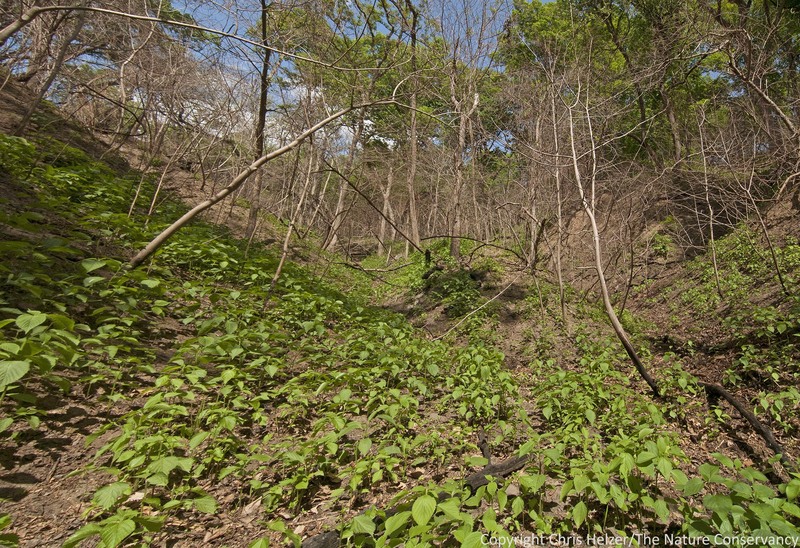 Here is a south-facing wooded slope with a lot of bare ground. Again, this will change over time as light-loving plants colonize and spread. 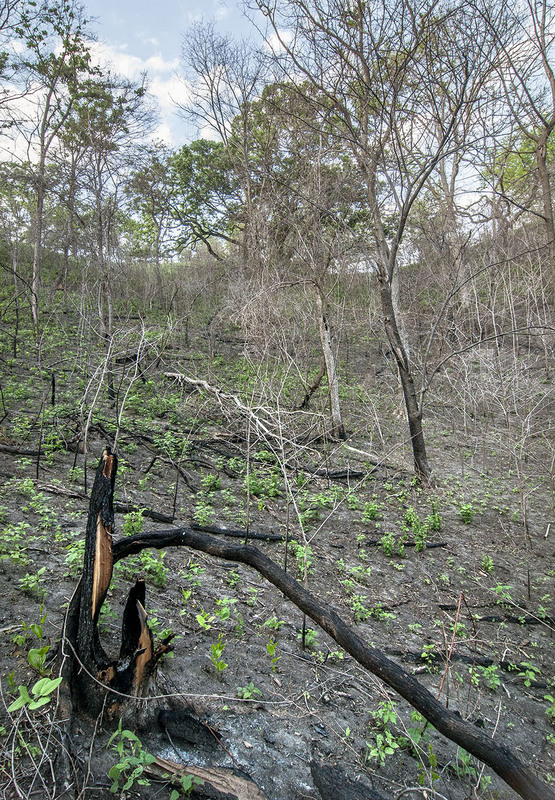 Here, many of the small trees were dead prior to the fire (from the hack-and-squirt treatment. 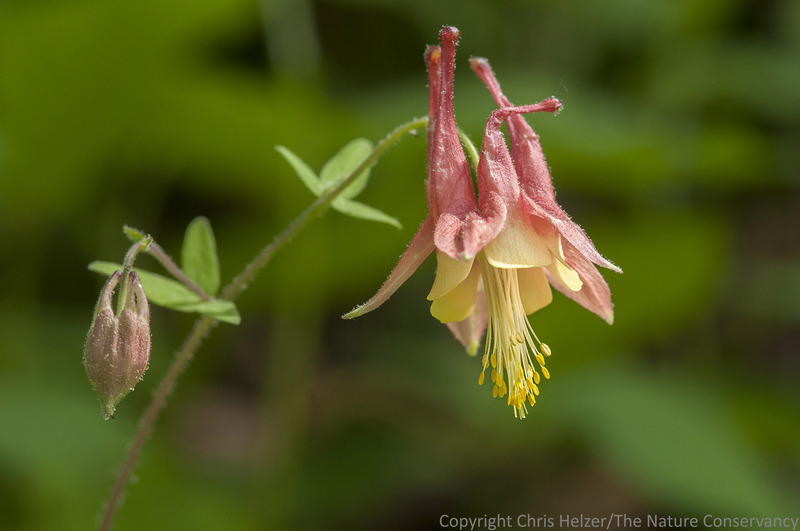 Columbine was blooming on north-facing slopes – mainly in places the fire skipped. Yellow ladies slipper orchids seemed to weather the fire just fine. I found all four of the plants we marked with GPS last year, and three of them were blooming. All four were in areas that burned. Here is the same prairie (left) and neighbor’s pasture (right) shown in an earlier photo (during the fire). The prairie looks vibrant, and numerous dogwoods were knocked back (at least temporarily). The small prairie ridges scattered across the preserve are greening up very nicely. Most of the bur and black oaks in those areas appeared to escape the fire with little or no injury. 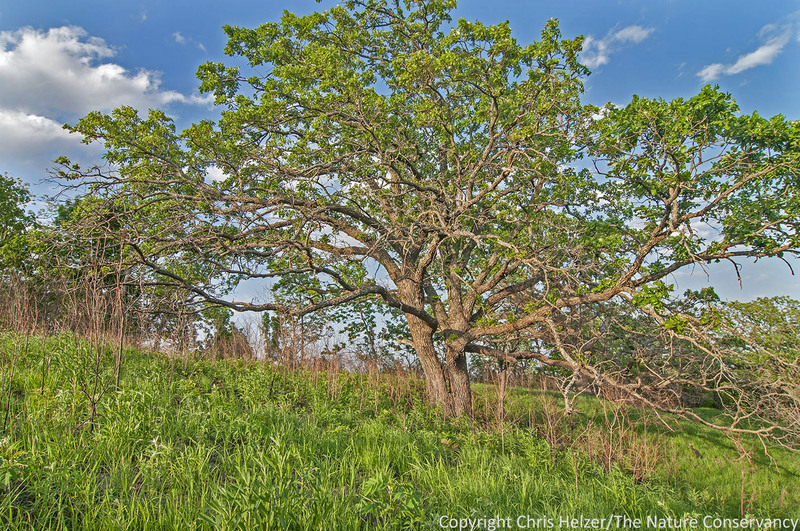 This beautiful spreading bur oak was clearly thriving – as were the prairie plants around it. The top-killed shrubs will regrow, but frequent fires (and maybe some basal herbicide treatments) should keep them at bay. 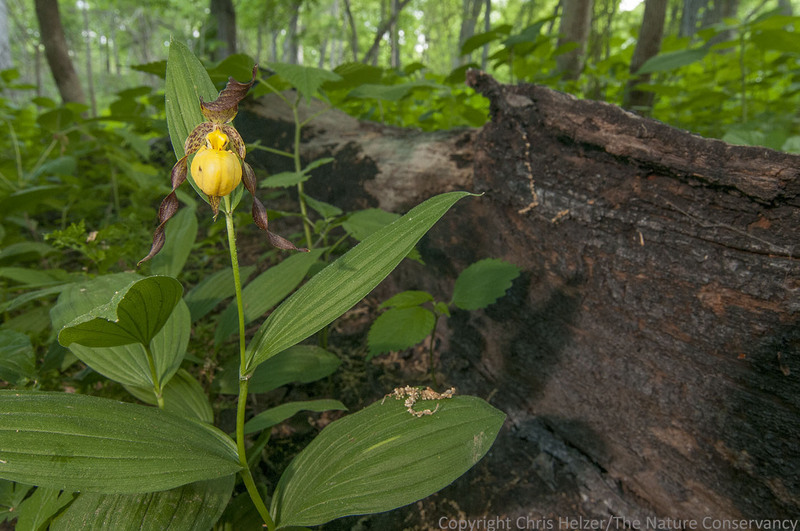 This entry was posted in Prairie Management, Prairie Natural History, Prairie Photography, Prairie Plants and tagged burn, controlled burn, fire, garlic mustard, mayapples, nebraska, oak woodland, orchid, photography, prescribed fire, rulo bluffs, the nature conservancy, wood nettles, woodland by Chris Helzer. Bookmark the permalink. Nice to see the benefits of controlled burns. Is that Virginia creeper in with the columbine? Is so do you have problems with it taking over? Karen – yes, it’s Virginia creeper, and no we don’t have any problems with it. The property is big, so big sprawling plants like V. creeper fit in just fine. I like it. 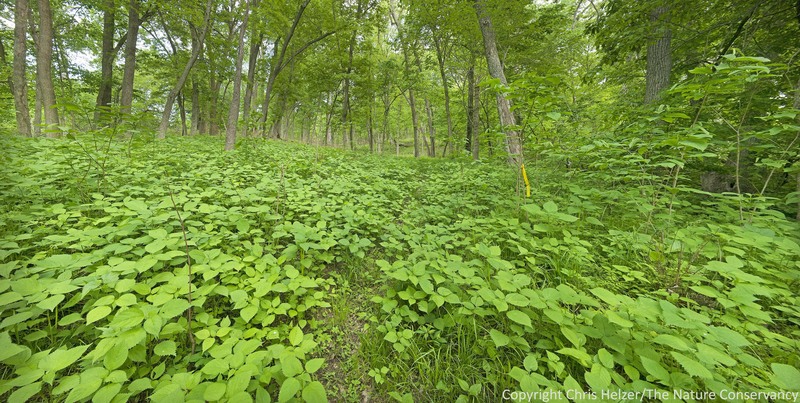 Chris – I have a little 2200 sq/ft woodland project on our property that was seeded in December of 2012. Starting in Spring of 2012 I killed it off (mainly brome, dames rocket, and yellow nutsedge) with a few applications of glyphosate. All of last year I kept it mowed and this year it’s looking pretty good but of course has some trouble spots. The seed I put down included several sedges and wildryes, plus about 30 forbs. Some areas are thicker with sedges and I’m suspecting mainly yellow nutsedge. What’s your view on yellow nutsedge growing in a woodland project? If your advice to try and get rid of it, any way to do it without wiping out everything else? I guess my first task is to try and identify it from the sedges I planted. Mike, I’m not sure what to tell you on the yellow nutsedge. Partly because there are a lot of sedges that have that common name, so I’m not sure which it might be. if you decide to get rid of it, you’ll probably have to do it manually, because I don’t know of any herbicides that would take out a sedge but not other sedges or grasses. Thanks Chris, your response explains why I get conflicting information on whether “yellow nutsedge” is native. If the yellow nutsedge in question is Cyperus esculentus, the common problem weed in lawns, there is a herbicide called Sedgehammer (Halosulfuron-methyl) specifically designed to kill it without harming grasses. What effect, if any, it has on forbs is difficult information to come by, though. I like the photo showing the neighbor’s pasture, and it brought up a question. What happens if a neighbor decides to use a crop duster? If a neighbor uses a crop duster, they have to keep the spray within their property boundaries. I’m pretty sure it’s the crop duster’s responsibility, but not sure if the landowner (the neighbor) has liability too. Unfortunately, drift from that kind of spraying does happen. I’m not sure what you can do about it (other than gripe or try to get damages from the crop duster) since once the spraying happens there’s not much actual remedy. Hi Chris, I did not phrase my question properly. I meant to ask if there were any proscriptions about using a crop duster near Conservancy land. It’s probably a silly question, but I still wondered if there was anything in place. It’s not a silly question. As far as I know, there is no legal mechanism available for restricting aerial spraying near our properties. I wonder how close the phenology is there to that in SE Wisconsin. 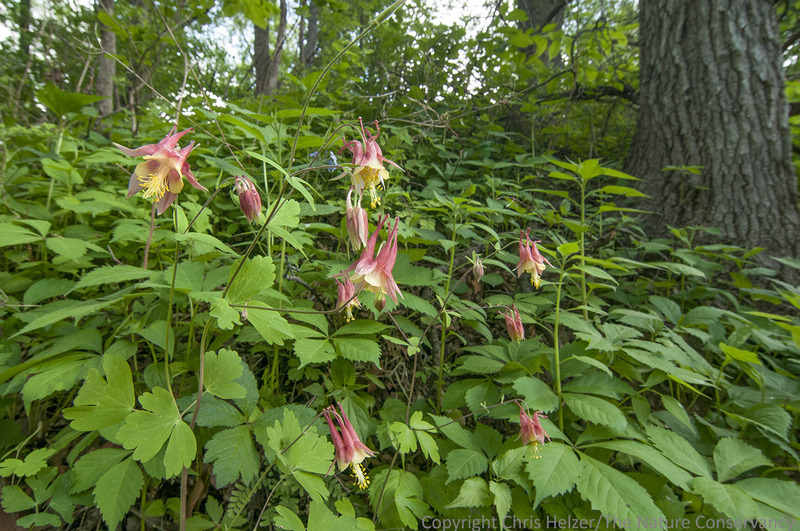 Yellow lady’s slipper and columbine started blooming two days ago along the trail near where I live, but are in full bloom now with the warm weather. Were these photos from the last few days? These photos were from about a week ago. The orchids had been blooming for a little more than a week at that point, I think. 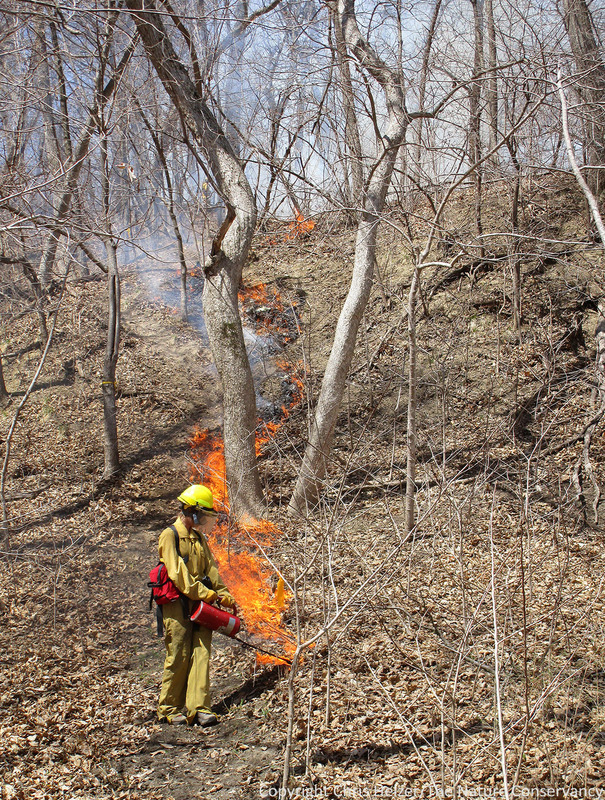 In late March I helped with a burn near Thurman Iowa about 55 miles north of Rulo. We were burning a deep ravine running north south. The wind was calm that day. The fire was started on the East facing slope. The fire was very slow advancing down the slope. There was a wet area at the bottom of the ravine. It was concerned that the fire would stop at the bottom. The fire advanced across the wet area and started up the west facing slope. The fire ran extremely fast up the slope with flame lengths reaching the average of four feet and some time much higher. The temp was about 60 degrees and humidity about 25 to 30 percent. We were all amazed at the speed the fire when up the ravine. The fuel load was oak and hickory leaves with some small brush. We let the fire burn up to the black line that had been established early that day. No crew members were ever in danger since on was preforming interior lighting. 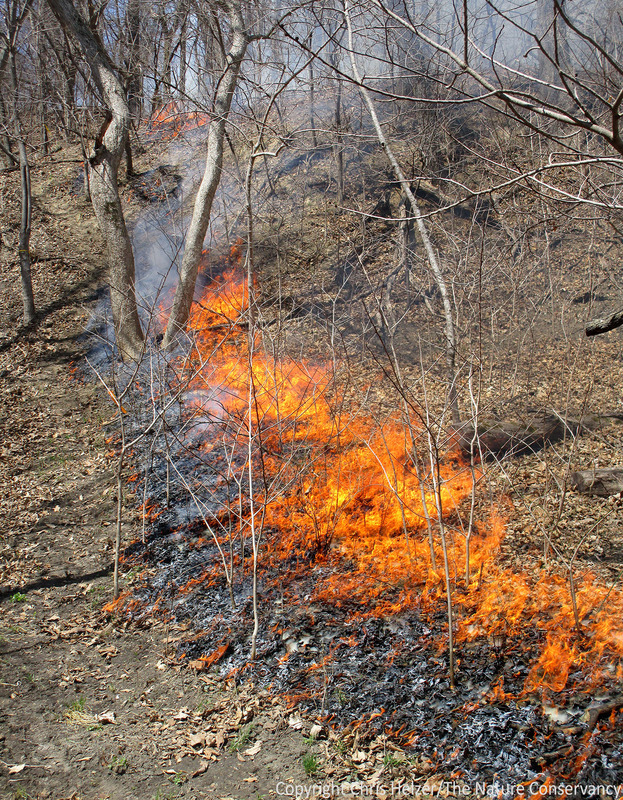 The lesson is that prescribed fire in woodland can be dangerous. Glenn – I’ve seen similar fire behavior on slopes – especially those south and west-facing slopes. Definitely something to be aware of from a safety standpoint. What plants do you expect will colonize the south facing slope with lots of bare ground? James, that’s the big question. I think many prairie plants will move downslope from the prairie ridgetops. I honestly don’t know the woodland flora well enough to know what to expect to move in for woodland/savanna species. Helianthus hirsutus is a likely early colonizer, but what that more mature open woodland community will look like is not something I’m an expert on. The worst case scenario is the new open niche will be filled by an even more problematic invasive species. You said before that conducting prescribed fires is stressful for you. What keeps me up at night is second guessing whether the work I do will result in a positive change or if it will create an even bigger problem.